Marcie started her singing career in 1960 at the age of fifteen with the Thunderbirds at Canterbury Ballroom and Preston Town Hall. She then joined up with Normie Rowe and The Playboys. In 1963 she joined the cast of 'The GO Show' , the television show which was to make her a household name throughout Australia. Marcie appeared on every national TV variety show in Australia over four decades. In 1967 Marcie together with the Cook sisters Margaret, Beverley and Wendy formed 'Marcie and the Cookies' which became the top female singing group in Australia. During 1969 and 1970, 'Marcie and the Cookies' performed extensively throughout Asia and Europe and toured the United Kingdom with Cliff Richard and the Shadows. They are still performing as a world class act and celebrated thirty years of performing together in November 1997. Marcie has toured with The Seekers, The Monkeys, Cliff Richard, Tom Jones and supported Gene Pitney on five national tours. Marcie was presented with an award from WEA Records in 1987 for her contribution to Australian music. Her stage performances include The Prodigal Son in 1972, See Saw in 1980 and Blues in the Night in 1992, and her recordings include 'I Would If I Could', 'Gonna Get Married' and the LP 'That Girl Jones'. Marcie has recently written and recorded many new songs which she includes in her performances. In 1999, Marcie released a four track CD titled "Pure Heart". One of the tracks from this CD, her own composition "George Jones" written about her father, won her a nomination at the 1999 Victorian Country Music Awards for Best Female Singer. She has won further nominations in the same category for both the 2000 and 2001 awards singing her own songs "Butterfly of Love" and "Long Boots". Marcie is still singing with that strong sassy voice and entertaining in the way she loves, and performing with her own band in the club and corporate areas. Her charisma, enthusiasm and ability to relate to an audience has found her a new legion of fans. Recent highlights include sold out shows at Crown Casino with Jamie Redfern and the Johnny Young Band, as well as a mini tour with Frankie J. Holden and Johnny O'Keefe's original band. On stage Marcie performs with vitality a repertoire of commercial covers, rock 'n roll and her own country style compositions and remains one of Australia's most dynamic female performers. 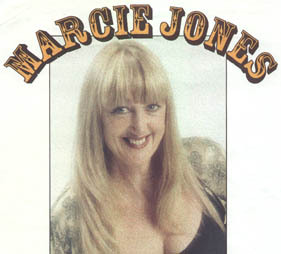 Marcie is currently performing to sellout houses with Johnny Young, Normie Rowe and Buddy England on the 'GO Show Reunion Tour' .